SCRATCH squeezes every ounce of performance out of your GPUs to provide unbeatable speeds during the entire post process. You will experience a streamlined, efficient, and powerful workflow that increases your productivity and creative ability. The latest SCRATCH V8.3 supports the KineRAW(.krw) codec, which together offer users the complete Kine + SCRATCH solution, from 4K/6K image capture through full post production. For purchasing, there are Kine-SCRATCH product bundles, and two options to buy SCRATCH from Kinefinity: a one-year rental license and a permanent license. Special discounts apply for Kine users. Please visit SCRATCH in the online shop for details. What's the special price of SCRATCH for Kinefinity camera owners? For oversea, Kinefinity camera owners can buy one license at such special price, while Kinefinity camera owners in China can buy up to three licenses at such special price. Buy One Kine, Get One SCRATCH, Now? Customers can buy SCRATCH at the above special price if they keep using SCRATCH after the first year. Can I buy SCRATCH in special price if I bought Kine camera before April 2015? Of course you can! If you bought any one of KineRAW-S35, KineRAW-MINI, KineMINI 4K and KineMAX 6K, you can purchase SCRATCH in special price, also following the same limit on quantity of license. What is the meaning of one-year rental license for SCRATCH? After the one year, how much do I have to pay if I keep using it? You can use SCRATCH for 360 days, after you buy the one-year rental license and activate SCRATCH with this license. You can get free update in 360 days (the license is valid). You can not use SCRATCH after 360 days of license activation, until you buy another license. For non-Kine users, they need to purchase at global MSRP. What is the permanent license? It will have free update? Permanent license means that you can use the SCRATCH with specific version when you purchase, always, no time limit. For non-Kine users, you can have only one year free update. For non-Kine users, one year update price is 999 USD. If I bought used Kine cameras from others, can I buy SCRATCH at the special price? If the previous owner of Kine cameras did not buy the license before he/she sold the camera, the new owner of Kine camera can buy the license. How to purchase the license and how to activate it? Download SCRATCH then activate the software by entering the license Key. Note: Please email us the MyAssimilate ID if you want to bundle the license key with your MyAssimilate. Can I use one license on different computers? Does SCRATCH support USB dongle? SCRATCH does not support USB dongle. SCRATCH can be installed in different computers, but one license can only activate one computer. How to download the latest version of SCRATCH? You need to download SCRATCH at Assimilate website: http://www.assimilateinc.com/trials/registration.aspx. SCRATCH can work on MAC? or Windows? MAC OSX 10.6.6 or above. Except KRW, SCRATCH can process other codecs or clips from other cameras? Yes. Except KRW, SCRATCH Full resolution support for RED, ARRI, Sony, Canon, Panasonic, BMD, DLSR and all other popular camera and media formats. Full resolution support for RED, ARRI, Sony, Canon, Panasonic, DLSR and all other popular camera and media formats. 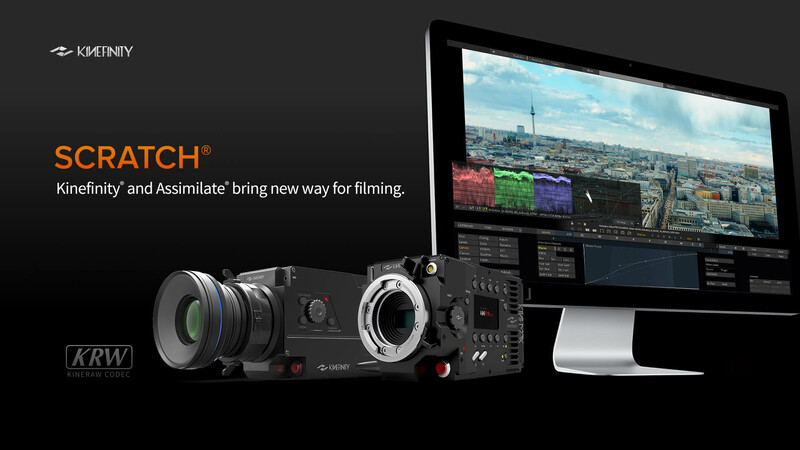 Featuring unmatched real-time performance and reliability, SCRATCH removes the risk and frees the filmmaker and DP to get the most from a high-resolution digital shoot. Shot Versioning, SCRATCH CONstruct manage multiple versions of the same 2D or 3D shots within the same timeline for easy comparison. No other software offers the range of tools for quickly conforming and checking against a reference clip. Sync timecode from multiple cameras (including stereo) with a unique “Match Timecode” function. Stack cameras into a single slot, then automatically sync the timecode all of cameras to one of them. Generate dailies by automatically naming clips based on any metadata field, including camroll, scene and take. Create flash burns either at the top and tail of a clip, or throughout its duration. Capture scene and take metadata automatically from broadcast wave audio files. Automatically generate new timecode for DSLR cameras such as the Phantom, Canon 5D/7D and GoPro that don’t support it. Easily increment the timecode with each slot and even skip by user-defined intervals. Populate Avid AAF files with extended metadata, avoiding the double pass to access that ALE files required. This effectively removes the need for separate ALEs. Select, update, add or remove metadata in a spreadsheet editor-style. Update metadata for a single shot or multiple shots at once, as well as update data by entering plain text or using formulas that contain other metadata items. New metadata can then be exported via ALE or XML to be imported into other systems or integrated with other proprietary tools. Match/find, load and apply looks to multiple shots in the form of 3dl, CDL, LUT or XML, and audio. This new feature will search and match by name, time-code, or any common metadata items. In addition, artists can now auto-link audio files to shots purely based on metadata and file name. Create dual views of any image in a project by quickly and easily selecting a version, a reference, a clip from any video track, or a color buffer. Imagine the creativity of a full stereo workflow that provides consistent, intuitive feedback during the conform, color grading and finishing process. Stereo image pairs are automatically linked for versioning and real-time playback to a wide variety of stereoscopic delivery systems. The new Live View function takes in the SDI signal from a camera and allows artists to work and grade directly on the camera feed. It also reads the camera metadata if available, which is then displayed in the metadata stack in the Player module. In addition, the name of a SCRATCH Gallery item can be based on the metadata of the current shot (e.g. Live View). The determined grade can then be easily linked to the recorded shot further downstream in the pipeline. These tutorials are from Assimilate SCRATCH. And we will also provide KRW workflow with SCRATCH very soon. Covers the main topics a DIT should control in order to provide efficient dailies to the offline editing. Those include color adjustments but also metadata management and audio relinking. create ProRes dailies using the Apple-licensed ProRes encoder in SCRATCH and Lab…..on a Windows machine. This tutorial shows how to load Lookup-tables into different locations within the color pipeline in SCRATCH; also address how to export LUT. Linear/sRGB, Log/Film, Rec709, UHD, XYZ (DCI), ACES, WideGamut, Scene Linear, P3 (DCI) and AdobeRGB. SCRATCH offers you the flexibility to mix various sources colors spaces within a single project and takes care of all the necessary color transforms up to your deliverables. Basically you can use the Consolidate function e.g. to move media to a different disk-system, archiving your project or to ensure all media is centralized in a single folder. how to handle anamorphic footage in SCRATCH. how to setup file-exports with either an aspect ratio, or square aspect. how to export 3D-LUTs from LiveGrade and use the LUT-matching function in SCRATCH to apply them. This entry was posted in FAQ and tagged KineMAX, KineMAX, KineMINI, kinemini, KRW, KRW, SCRATCH, Scratch.